Over the weekend came more hawkish Trump trade rhetoric, limiting Chinese investment in US companies. Markets duly fell hard, with SPX giving up 1.31%, its worst day for two months, and cancelling all the gains for the month. In line, the VIX hit a two-month high. Other indices followed suit, DAX not being helped by the mixed IFO sentiment reports at 08:00. In currencies, DXY pulled back from the HOY reached last week, to close 0.2% down. GBP, EUR and JPY, the main components were up, but CAD was slightly down in line with drop in Oil prices, and AUD was notably down 0.34%. The result of the Turkish election (Erdogan re-elected) produced a standout 3% gain in TRY, although this all evaporated by the end of the day. Gold did not follow either the risk aversion or USD trend and was down $3. It started a decline which lasted all week, following a technical trend to Dec 12 low. US 10-year Treasury Bond yields were flat. A slight Turnaround Tuesday today, but not much, with only really tech and energy performing, the latter boosted by a 3.61% jump in the WTI price, which spiked after we got a ‘white swan’, as the US State Department ordered buyers to cut Iranian imports. SPX added 0.2%, and NKY was also up, helped by a weaker yen. The inter market importance of oil was shown by contrasting the oil-free DAX (flat) with the oil proxy FTSE (up 0.84%, much more than SPX). All this was before a significant shift in the API Oil Stock print at 20:30, improving to -9.29M from -3.02M (lower is better). EUR had a full turnaround, giving up Monday’s gains, and all other currencies were down slightly, giving DXY a healthy 0.5% gain on the day. Gold was down to a new 2018 low, and yields had a second flat day. Tuesday was also was a bittersweet day in the history of GE. On Nov 7, 1907, the doughty US conglomerate replaced the Tennessee Coal, Iron and Railroad company to join the DJIA, where it remained for 111 years, the last company from that era to do so, and the longest member of any US index by far. GE was also a member of the original Dow 12 index calculated by Charles Dow himself in 1896. In 2000, it was the largest company in the world by market capitalisation. Today, after falling 60% in the last two years to a weight of less than 0.5% of the index, the stock was ejected in favour of pharmacy chain WBA. Sic transit gloria mundi? Perhaps not. This came on the same day that the company announced divestment of its Baker Hughes oil division, and the shares rose 8%, the best one-day performance for three years. A mixed picture, for once, on indices as an early rally in US and Japanese stocks on a potential softening of Trump’s China trade position faded and both ended in the red. As always, sentiment in currency tends to last longer and DXY was sharply up 0.62% again by the end of the day, the corollary of which is that the weakened EUR and GBP delivered a green candle for both DAX and FTSE. The rest of the currency profile was risk-off as AUD (substantially) and CAD (slightly) also fell, yet JPY was flat. CAD was helped by a further Oil advance after the substantial EIA beat (-9.89M vs -2.57M est) at 14:30, in line with the API print, and the sharpest weekly decline since September 2016. Gold, increasingly unreliable as a risk-off indicator fell for the third day, another 2018 low. Also counter-intuitive were yields, which fell 5bp, rather a lot for a weakly risk-off day and not in line with the stronger dollar. Oil continued the ‘Iran’ rally, adding another 2.34% to a new three-and-a-half year closing high. Despite the US GDP partial miss (on the annualised figure) at 12:30, equities staged a recovery rally on Thursday, SPX putting on 0.58% to recover the previous day’s losses. DJIA new entrant WBA got off to a bad start, dropping 10% on news that AMZN are entering their market. NKY and FTSE were also up, the latter being help by the continuing Oil rally (up 1.32%) which also saw CAD add 92 pips (0.69%). DAX, as ever does not participate in Oil rallies, and was down again. Indeed, the automotive sector (20% of DAX) are ultimately consumers not producers of Oil. Coupled with Chancellor Merkel’s political problems, and potential car sanctions, this was proving to be the weakest index for a second week. EUR and AUD were fairly flat, and GBP lost ground to a new seven month low, on worries about that the EU was stepping up unilateral plans for Brexit, resulting in a nearly-flat (up 0.04%) DXY, which nevertheless still hit a new 2018 record. Gold and JPY were down, and yields up in line with a return to risk-on. The US10Y-US02Y spread narrowed to 0.32%, the lowest in a decade. Equities were mixed today. 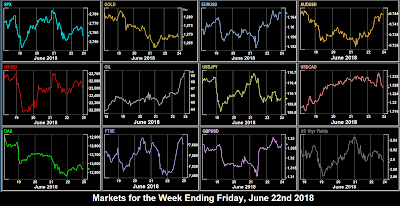 All rallied then faded, with SPX closing flat, NKY and FTSE down, and DAX actually showing a slight upturn after the European Council immigration deal (referred to last week). The early rally in the SPX was probably helped by the PCE (CPI proxy) YoY beat at 12:30, coming as it did after the QoQ miss the day before. The immigration deal gave a strong boost to EUR, it was up 90 pips in the Asian session, and finished the day 114 pips up. Coupled with strong gains elsewhere, including CAD after the GDP beat at 12:30, and GBP after an upward revision in Q1 GDP, DXY had its worst day since January, shedding 0.88%. Even NZD and Gold turned up after falling all week. Counterintuitively again, yields were slightly up. Oil continued its rally, up another 1.3% today, and 16% up in the last two weeks to close at $74.26, a 19-month high. The 61.8% fib from the 2014 high is less the $3 away. A mixed week for USD, up against some and down against others. The weakest currency for a second week was NZD, and the best trade would have been to sell it against CAD, making 3.00%. Also for the second week, DAX was the worst performing index, and Oil was the biggest mover. For the first time, the two major cryptos moved in opposite directions, but again with little volatility. The weekend saw two tariff changes. Canada introduced their retaliatory tariffs on steel, and conversely, China reduced their import tariffs on cars and auto parts. Also over the weekend is the Mexican Presidential election, where left-winger AMLO is widely expected (20% ahead) to win, potentially a game changer for NAFTA. The UK Manufacturing PMI is important as GBP is as an 8-month low, and rate hikes are on a knife-edge. Markets are closed in Canada and Hong Kong due to local holidays. The key release today is the RBA Rate Decision. A hold of 1.5% is expected, so the market will be looking for something hawkish from Governor Lowe after AUD briefly dipped under, then bounced off a 13-month low last week. The currency is currently suffering from the intermarket effect of gold’s decline, and recent risk-off sentiment in global markets. It does not of course help that the 1.5% rate, once attractive for carry, now lags USD. In other news, there is a rate decision on SEK (4.2% of SXY), Turkish CPI at 07:00, and the NZ GDT milk auction, which we have found does have a consistent effect on NZD (which like AUD is at 13-month lows). US markets close early at 17:00 (ie 13:00 EDT) in advance of Independence Day. Today is Independence Day and all US markets are closed. Futures on US markets are electronically traded globally but close at 17:00 (VIX at 15:15). Volume, and therefore volatility is expected to be very low. The UK Services PMI is important for the reasons mentioned on Monday above. BoJ Harada (dove) speaks at 01:30. Commentators are looking for an indication in the FOMC minutes of how close to ‘neutral’ (rates track GDP) the bank thinks rates are, as US growth forecasts are more positive than the inflation or earnings figures. Focusing on this metric would be seen as hawkish. Also today we have the ADP ‘sneak preview of NFP’ report, one day late because of the holiday. The estimate is only 10k apart from the NFP estimate. A surprise may move markets a day early. As well as BoE Governor Carney, CB speakers today include BoJ Masai (centrist) at 01:30, and ECB Mersch (hawkish) at 17:15. The big story on the first Friday of the month is always NFP, and this month, the Canadian and US figures are back in sync, meaning that USDCAD volatility is almost guaranteed. Today the first wave of 25% US ‘Section 301’ tariffs on Chinese goods is applied. China may say something about retaliation. Also there is a major UK cabinet meeting about Brexit transition. All the equity markets we cover continued the slide from Friday, on trade war fears escalating over the weekend. DAX fell particularly heavily (284 points, 2.18% and a marubozu candle) on the German political problems relating to Chancellor Merkel’s increasing unpopular refugee policy, and the arrest of the CEO of Audi, part of Volkswagen, Germany’s biggest company. VOW shares actually outperformed the DAX, falling only 2.16%, but they had already fallen 3.55% on Friday. 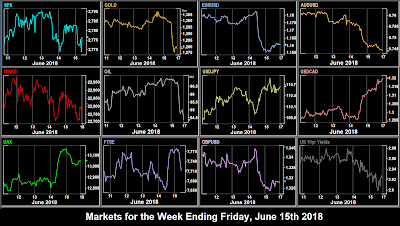 The risk-off mood mean Gold and JPY were up, as was EUR after its heavy fall last week, and commodity (risk) currencies AUD and CAD were down, as was GBP, which, along with a rise in Oil, limited the FTSE selloff, which recovered from a 111 point drop to finish only 21 points down. US 10-year yields were down in line with the fall in DXY. On Monday evening, President Trump confirmed the market’s fears by announcing proposals to put $200Bn of further tariffs on Chinese goods. The total of $250Bn represents nearly half of all Chinese exports to the US. 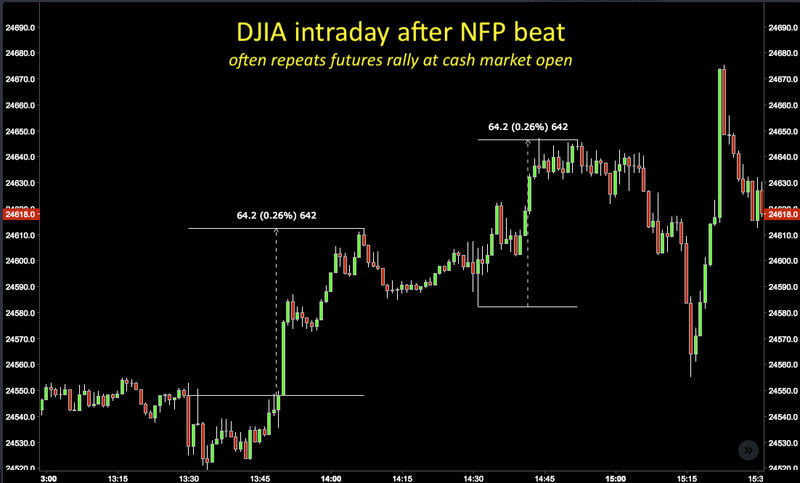 The reaction was strong in the Asian session with DJIA down 300 points and NKY down 550, and JPY up 85 pips. CNY touched a five month low. The markets recovered somewhat during the European and US sessions, but still all ended in the red. This was a good day for USD, despite the yen move DXY was up 28c (0.29%) to a new 2018 high as all the other currencies faded, with EUR touching a two-week low as at Sintra, ECB President Draghi reiterated that there would be no rate rises funtil September 2019. Gold and Oil were down in line with the stronger dollar, but the reaction was not seen in bonds as yields took the risk-off view (money rotated from equities into bonds) rather than tracking DXY, in contrast to Gold which tracked USD rather than acting as a safe haven. We know of course that for much of this year, Gold has acted as a commodity rather than a safe haven. Oil’s move also reflected concerns about the forthcoming OPEC meeting. Other than the DAX (down slightly by 20 points), markets recovered on Wednesday, but only slightly, as money rotated into tariff-insensitive tech stocks, with NDX hitting a new intraday ATH of 7310. This was probably only a technical move, as there was no further trade war news. At Sintra, Fed Chair Powell reiterated the case for rate hikes, and there was an immediate reaction in yields, which closed up 4bp on the day. USD was also up, but only very slightly. Gold was down $4 in line to hit a six-month low as USD and equity risk status were pointing in the same direction. Oil staged a small recovery after the EIA beat at 14:30. 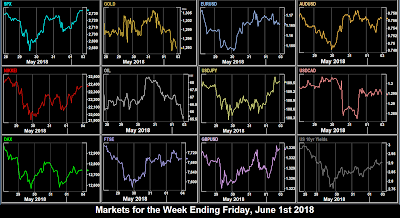 Traders had swallowed their fears on Wednesday, the last day of spring (in the Northern Hemisphere), but one swallow does not make a summer, and today saw the trade war inspired downward slide in equities continue. Again DAX suffered most, as President Trump threatened to increase German car tariffs (DAI, BMW, VW and CON are 20% of the DAX). In forex the main story was the BoE rate decision. Although the 0.5% rate was held, the voting was 6-3 against 7-2 estimated, and importantly it was Chief Economist Andy Haldane who changed sides. GBP put on 0.91% after the announcement. EUR and AUD were also up, and although JPY and CAD were slightly down, this was enough, along with the Philly Fed Manufacturing print miss to bring DXY back from an early 2018 high of $95.53 to close 0.29% down on the day. Gold was flat on the day. Oil was up again, after hopes rose that cuts might stay in place at the OPEC meeting. Yields were down in line with DXY. NZD briefly hit a new 2018 low following the contraction of GDP from 2.9% to 2.7%, before recovering in the US session. The OPEC meeting closed with some increase in production output agreed, but not as much as the market had feared. The reaction in Oil was strong, with a green marubozu candle (don’t often get two in one week) up 5% on the day, and the intermarket effect was seen in oil proxies FTSE (up 114 points, 1.51%, recovering all the week’s losses) and CAD up 0.31% despite a 107 pip (0.81%) spike down after the miss on CPI and Retail Sales at 12:30. 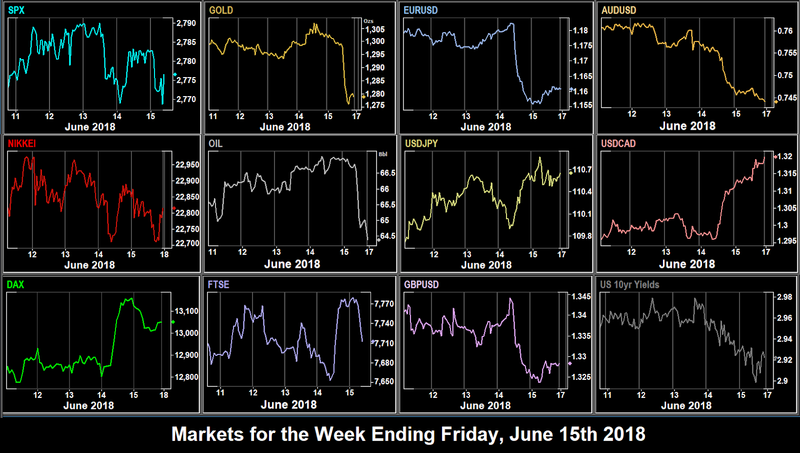 NKY was also strong, recovering all Thursday’s losses and more, but SPX and DAX only recovered about half the previous day’s drop, the latter reacting to automobile worries and strong EUR. 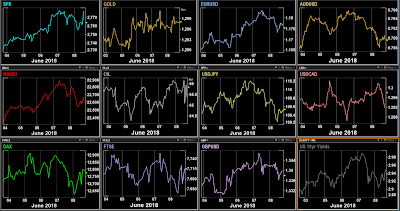 The single currency had its best day this month, putting on 0.49% after the Eurozone PMIs beat at 08:00, but in any event USD was down across the board, slipping against all the majors and Gold, with DXY down 0.35%. NZD rallied 0.63% but still ended the week down. Yields were flat on the day. Notably Bitcoin made a new 2018 low, dipping briefly below the $6,000 roundpoint and previous Feb 6 (from 21:00 to 23:00). The dollar was fairly flat this week, although there were some good intraday trades, such as USDCAD on Friday. The biggest movement for the week was NZDJPY down 1.03%. Index traders had the best result from shorting the DAX. Cryptos continued to fall although not as sharply as last week. Tuesday is even quieter. Fed Speakers Kaplan (non-voter) and Bostic (voter) are both centrists, so given Chair Powell's clear position at Sintra, they are unlikely to say anything which moves markets. The only hope of volatility (save of course a Trump black swan), are the NZ trade figures which precede the rate decision on Wednesday (Thursday local). Three CB speeches today, with BoE Governor Carney speaking in London on the Financial Stability Report, and BoC Governor Poloz on transparency and trust at the Greater Victoria Chamber of Commerce in British Columbia. Also a rare appearance by Fed Rosengren (hawkish, non-voter) at 16:45. A hold at 1.75% is expected, but anything hawkish from the RBNZ could have a strong effect on the Kiwi. Following the business sentiment print on Monday, we have the German consumer sentiment today, followed by the inflation figure at 12:00. German estimates are known to be accurate (many more print ‘as estimate’ than other countries), so no surprises as expected. GDP is less of a market mover than CPI and jobs, but any serious variation in the US print would nevertheless cause volatility. The two-day European Council meeting is likely to focus on immigration, although Brexit may also be covered, which would affect sterling. NKE (2.06% of DJIA) reports after the bell. The end of the week, quarter and half year should bring some volatility as investor rebalance their portfolios. The economic prints are less important as in both cases, the major releases have been front run. The PCE print is overshadowed by the quarterly print the day before, and Eurozone CPI comes after all the individual countries report. Also, all eyes will be on the weekend which is unusually busy. Announcements on restrictions for Chinese investment is US tech are due on Saturday, ironically as pre-agreed (and priced in) Chinese import tariff cuts come into place the next day. Also on Sunday, staying with the trade war, Canada is due to announce retaliatory tariffs on $12.8Bn of US products. Note however, that this is less than 0.1% of US GDP. And finally, there is the Mexican general election is likely to return hard-left candidate Obrador. The focus will be on his party’s majority. Weekend gaps in MXN and CNY are a distinct possibility. 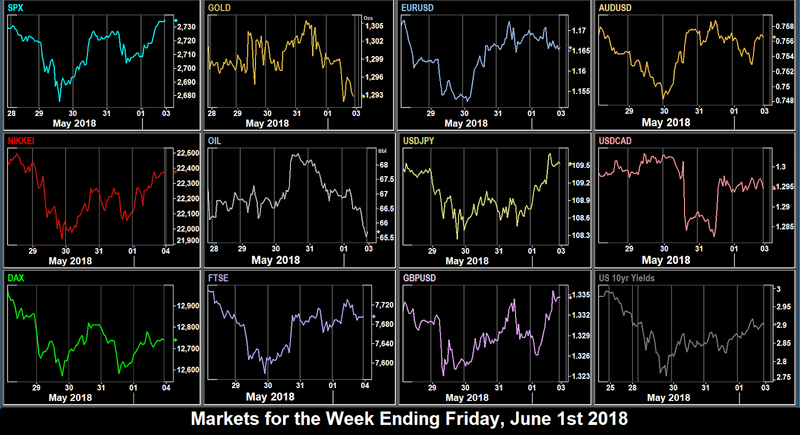 Despite the acrimonious fallout from the G7 meeting, there were positive comments from Italy’s new finance minister, and equities advanced on Monday, with SPX making a three-month closing high. The dollar was virtually flat, as was Gold. DXY added 0.09%, mainly because of a 0.5% drop in CAD (9.1% of the basket) after Trump’s remarks were specifically directed at Canadian PM Trudeau. Oil put on 0.4% towards the end after a largely flat day. US 10-year bond yields were flat. The much vaunted Trump-Kim meeting turned out to be a damp squib, with nothing of note, either good or bad being reported. Equities were mixed but volatility was light. The US was slightly up, after the partial US CPI beat (core print as expected, raw—including food and energy—beat) with SPX adding 0.2%, and notably the Nasdaq Composite ($COMPQ, not the Tech 100) hit an intraday ATH. 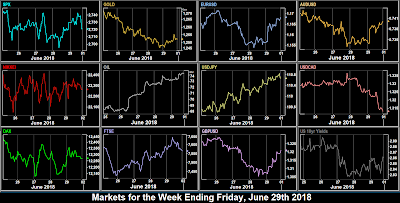 However the other equity markets did a Turnaround Tuesday and generally gave up the previous day’s gains, probably because the dollar was up (slightly) across the board. Gold and Oil were down in line, and yields had another flat day. The Fed raised rates to 2% as widely predicted, and indicated two further rises this year, one more than predicted, and the effect was seen in SPX which (a) once again followed the weekly average pattern we mentioned last week, ie turn at the end of Wednesdays and (b) the normal negative reaction of equities to a rate hike. The US benchmark fell by 0.61% from its 15:00 high. NKY, which had put on 100 points during the Asian session gave up all that. FTSE and DAX were less affected and ended the day fairly flat. The hawkish Fed comments did not affect currencies as you would think, although JPY was down. However, DXY was down overall 0.3% on the day, after a strong showing from EUR. CAD and Gold were also up, and AUD and GBP were flat. However bond yields were up 2bp and the curve narrowed, with the two-year yield up 3bp. The rate hike was priced in, so maybe traders were now waiting to see what the ECB did the next day. Oil rose 1.1% on the day after a beat on the EIA stock print at 14:30. The US rate hike was priced in, but the hawkish dot-plot was not. The ECB confirmed the asset purchase taper in December, as predicted by BuBa President Weidmann last week. This was also priced in. What was not priced in was a signal that any Euro rate hike would not come before Summer 2019. As you might expect EUR promptly fell hard (2.42% by the next morning, the worst 24 hours since the Brexit vote), but as you can see from this chart, after a muted response on Wednesday, all the other currencies fell sharply (JPY less so) after the ECB announcement at 11:45 (not the press conference at 12:30). 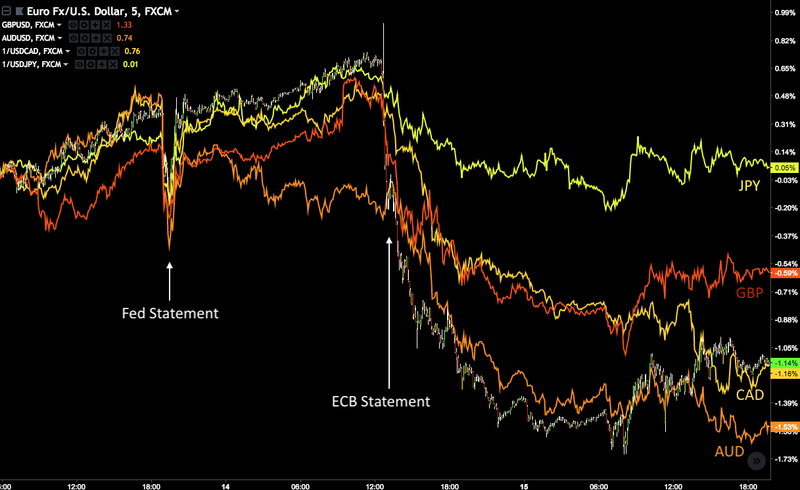 These falls therefore must be a delayed reaction to the Fed, rather than solely linked to the ECB. The SPX recovered some of the Fed-inspired decline putting on 0.31%, and NKY was up after losing 100 points in the Asian session, but the real story was in Europe where DAX added 2.2% and FTSE 1.1% as a direct reaction to their respective currency fades. DXY had its best day for virtually two years (since Brexit vote day, when GBP dropped 8%), adding 1.47%. Despite this, Gold was up $4—the reaction came later, and equally surprisingly bond yields fell 4bp, with the US10Y-US02Y gap closing by 3bp to a new 10-year low. Oil continued Wednesday’s rally to hit a high for the week, briefly nudging above $67. The jobs miss at 01:30 in Australia may have contributed to the AUD decline, which as you can see, started earlier than the others. Fresh concerns about the US-China trade war surfaced on Friday, and indices gave up some of Thursday’s gains. It was also Opex day. All indices were down. Currencies were mixed. 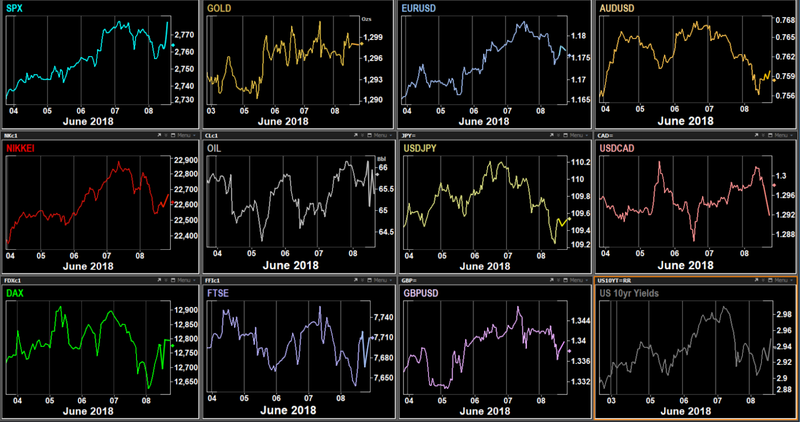 After the large moves the previous day, EUR and GBP recovered some ground, the latter after a stellar Retail Sales beat (4.4% vs 2.5% est), whereas risk-on commodity currencies CAD and AUD continued to fall, (the former to a 2018 and near 12-month low), a pattern we have seen in previous weeks. JPY, which has been a little detached from the others recently, stayed flat after the BoJ rate hold. Gold had a delayed reaction to the USD rally, and gave up 1.72% to make a new 2018 low. Oil also fell sharply, losing over 4% on a mixture of the strong dollar and concerns that Saudi Arabia and Russia were planning to increase output at the OPEC meeting next week. 10-Year yields were down 2bp, as were the 2-year notes. The net result of the various rate decisions was a strong week for USD, with DXY putting on 1.34%, and all currencies down. The biggest loser was CAD, down 2.14%. The fall in the euro meant DAX was the winner in indices. Crypto-currencies crashed again, heading towards new 2018 lows. The week opens with the ECB’s Sintra conference (in Sintra, Portugal), where President Draghi will make the opening remarks. This is Europe’s equivalent to the US Jackson Hole conference. Fed member William Dudley (centrist, voter) makes his final speech and retires, to be replaced by existing FOMC member John Williams (hawkish, voter). Chinese markets are closed for the Dragon Boat (Tuen Ng in Hong Kong) festival. There is little news. Sintra continues with a further speech from Draghi. Fed Bullard (dove, non-voter) is also speaking at the conference. Away from Sintra, ECB Hakkarainen is on in Frankfurt at 10:15. Again, not much economic news. Tech heavyweight ORCL reports after the bell. The final day at Sintra has ECB President Draghi, RBA Governor Lowe and Fed Chair Powell all on together at 13:30, preceded by ECB Lautenschläger (hawkish, voter) and Coeuré (hawkish, voter). Elsewhere ECB Villeroy (centrist, non-voter) speaks at 07:30, as does BuBa President Weidmann (hawk, voter) at 09:45, both in Paris. The 7th OPEC two-day international seminar opens in Vienna, and traders will particularly be watching for remarks from the ‘Global Oil Market Balance Metrics’ session which starts at 12:30. In Japan, the current session of the Diet closes today. After the raft of speeches earlier in the week, focus turns to the BoE and the GBP rate decision. A hold is expected, but last week’s data was mixed. The important core CPI was as expected, with a miss on the food/energy inclusive figure, yet there was a blowout beat on CPI proxy Retail Sales. Nevertheless the miss, and reversal on Average Earnings will probably service to kick the decision down the road. Watch for the voting figures, the consensus is 7-2. There are also rate decisions today in Switzerland (07:30) and Norway (09:00). The OPEC conference continues for a second day. The OPEC seminar is followed by the 174th Ordinary OPEC meeting, where output changes will be decided. This may be more important than the conference. Otherwise the main event of the day is Canadian Retail Sales and GDP. CAD broke to a near 12-month low last week with the Fed rate hike, NAFTA concerns, the Trump/Trudeau spat, and the receding price of Oil. Something positive in these prints could make a big difference. Indices continued to rally on Tuesday, with another ATH for NDX and RUT, two indices considered to be less affected by trade wars. DAX was virtually flat on the day, after EUR rallied as tensions reduced in Italy, and FTSE and NKY were slightly down on a stronger pound and yen respectively, the former after the UK Markit Services PMI beat at 09:30. We can say that the USD trend was down as Gold, Oil, and bond prices (inverse to yields) were up, however CAD and AUD were down, the latter after the RBA rate hold at 04:30. A third day of rally, this time across the board as all indices were up, more on momentum than news. This was despite further rallying of EUR and GBP, the former because ECB board member and BuBa President Weidmann that the central bank could end its bond buying programme before the end of 2018. German Bund yields rose 10bp, and even US yields put on 5bp, despite the day being weak for USD. AUD was strong after the GDP beat at 01:30, as was CAD after the Trade beat at 12:30. In fact JPY was the only currency to fall, leaving DXY down 0.1% on the day. Gold was flat, and Oil was down 0.7% after the EIA Stock miss at 14:30. 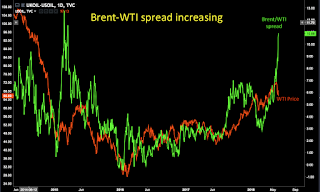 Notably Brent was up 0.5%, widening the BNO-WTI spread. We were guided on Thursday by the weekday average chart for SPX provided by our friends at marketseasonals.com. This week the index performed almost exactly as the average, with NDX and RUT coming off their highs. The picture was not uniform, as SPX was flat, and DJIA was actually up, following a sharp 4.37% rise in MCD after restructuring plans. DAX and FTSE came off even more sharply as EUR and GBP continued their upward path. This often happens with a few days of currency appreciation, the relevant index breakdown is delayed and then happens suddenly. The risk-off mood (Gold, JPY and bond prices up) was exacerbated by weekend G7 worries after Trump set out his position in a combative tweet. Also Italy is not yet right, Italian 10-year yields added 10bp today. When you add in the potential German car tariff Trump has been talking about, the DAX fade of 178 points (1.38%) was not surprising. In forex, whilst EUR, GBP and JPY were up, AUD and CAD bucked the trend again and fell. Oil was up nearly 2%, erasing the previous day’s losses after reports that troubled OPEC member Venezuela was a month behind in its deliveries. 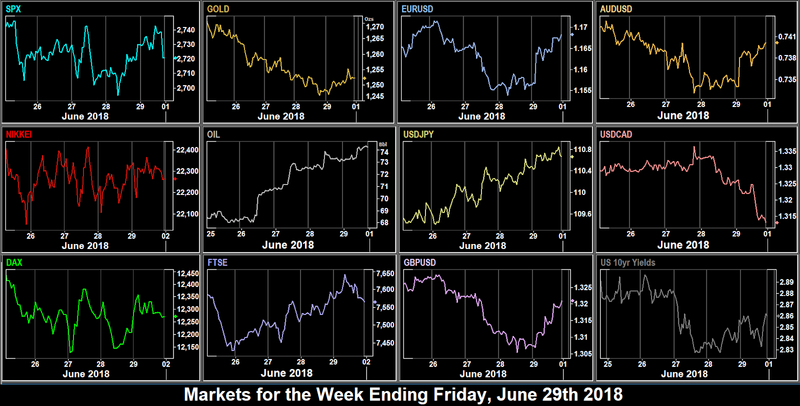 After a poor start due to G7 tensions, US markets still managed to close green Friday, although as you might expect, non-US markets fared badly, as the potential victims in a trade war. Risk-off JPY and Gold were up. Currencies reflected the equities position, ie USD was up, and European currencies were down, as was AUD. Yields were up in line with the stronger dollar (or perhaps it’s vice versa). The surprise move of the day was CAD which despite the miss on jobs at 12:30, the Trump/Trudeau tension, and a volatile but ultimately down day in Oil, still managed to put on 0.35% (45 pips) to end the day and week green against the dollar. A low volatility week. USD was down across the board, but only slightly. The best forex trade was buying EUR, but even this yielded less than 1%. Indices were similarly flat, with SPX being the best trade. Cryptos followed suit with a second sub-10% week . A packed week ahead includes three rate decisions, four inflation prints, and two jobs reports, as well as plenty of opportunity for Trump-related black swans. Monday is likely to be dominated by the fallout from the G7 meeting. The British broker IG Markets runs a proprietary weekend market for DJIA, FTSE and DAX, and you can see that the 150-point DJIA drop indicates a gap down open. The only news today is UK Manufacturing and Production and Trade Balance. No Fed speakers today as the pre-FOMC purdah continues. Australian markets are closed for the Queen’s Birthday (but curiously the UK is not). Today is the possibly historic Trump-Kim summit. Anything positive here could deflect market trade war concerns, and of course the day will have finished in Singapore before New York opens. In the UK, the Brexit bill goes back to the House of Commons, and we have the key unemployment and average earnings figures. These will need to be good to keep up GBP momentum. Also out is US inflation, although this print is too close to FOMC to make any different to the rate decision. FOMC Rate Set day, and a rise from 1.75% to 2.00% is widely expected. No change is expected to the ‘dot-plot’, the summary of all voting members future intentions. A speech by Chair Powell is scheduled and his language will be watched closely. No let up in matters affecting GBP, with the all-important inflation figure this morning. Key is the ex-food and energy figure estimate at 2.1%. The fourth print to affect GBP this week is Retail Sales, although this will have less effect as it is only an inflation proxy, and the real thing was the day before. Traders now have all the information they are going to get to predict whether the BoE will raise rates next week. The main event of the day is the Euro rate decision, or more correctly the 13:30 press conference, where traders will be looking for ECB Pres Draghi to confirm Weidmann’s bullish remarks last week. German CPI earlier in the day will also have an effect on EUR although this rarely deviates from the estimate. The US Retail Sales print is less important because the same reason given above about the equivalent UK print. The third rate decision of the week comes from Japan, although this is less of an event—unless of course BoJ Gov Kuroda says something unexpected. In practice in a week like this, markets will still be digested the ECB and Feb positions. ECB Cœuré speaks at 08:45. Also today, the USTR to publish final list of $50bn Chinese imports subject to 25% tariff. This many affect certain sectors in US stocks. Although markets were closed in the US and UK today, the decline in DAX, driven by Italian concerns was reflected in the FTSE and US futures markets. NKY was down in line. EUR rallied in the Asian session on hopes on resolution in Italy, but then faded the rest of the day to end 0.53% down. However, although AUD and GBP were also down against USD, CAD was flat (along with Oil and Gold), and JPY was slightly up meaning that DXY only put on 0.18% on the day. The bond market was closed. Concerns about Italy, in particular the prospect of a fresh election in which populists would gain an even larger share of the vote, continued to dominate. 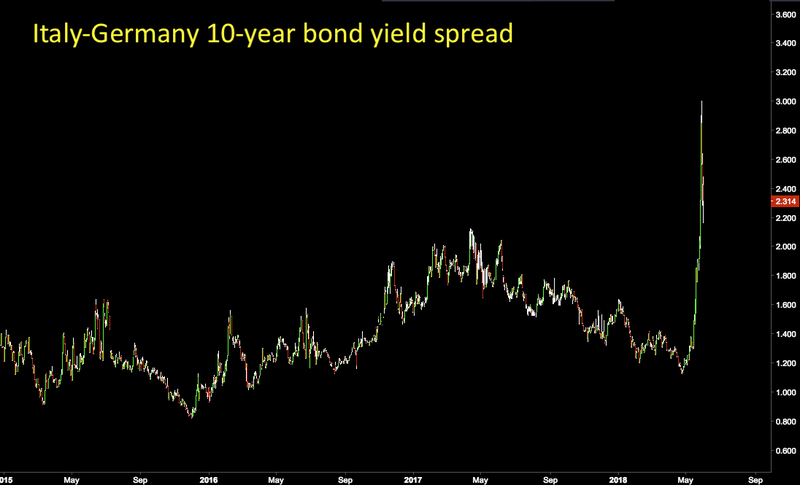 Italian bond yields broke the 2% barrier for the first time since 2013, and peripheral markets Spain and Portugal followed suit. 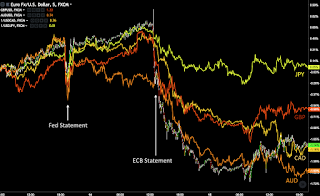 All the main equity markets fell hard, as did the EUR. GBP and to an extent risk-on commodity currencies CAD and AUD fell in sympathy, although oil was flat. As money moved into safer US bonds, we saw the triple risk-off test; Gold, JPY and US bond prices (inverse to yields) all up sharply. Despite the US misses on ADP jobs (12:15) and GDP and PCE (12:30), US markets also rallied, with SPX recovering all the previous day’s losses, and NKY followed. 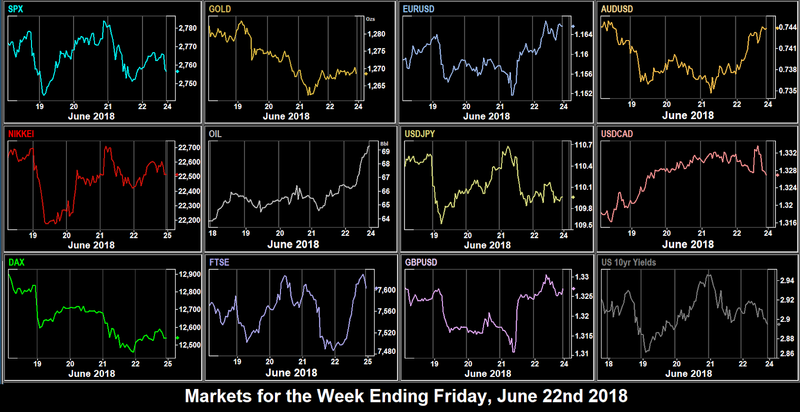 In Europe, both EUR/DAX and GBP/FTSE similarly recovered, and all currencies were up against USD except JPY which retreated in the risk-on market. Gold followed the weaker dollar, not the risk on, and was up $3 on the day. Of particular note was CAD which put on an immediate 178 pips (1.37%) on hawkish BoC rhetoric following the rate hold. Oil rallied by 2.4% on reports that the proposed raising of output (mentioned last week) may not be as soon as previously though. This of course also helped CAD. With Italy out of the way for now, the tariff deadline we mentioned last week arrived, and the US confirmed they would impose steel and aluminium tariffs on the EU, Mexico and Canada. Markets duly retreated again. DAX fell the most (1.4% in the cash session), mainly because of a 7.7% fall in DB after the troubled bank was placed on a US regulator’s ‘problem’ list, but SPX, FTSE and NKY were also down. Currencies were mixed. CAD showed an effect we have seen before. A sharp move in one direction (the hawkish remarks yesterday) is often reversed on the next piece of significant news, in this case the GDP miss (1.3% vs 1.7% est) at 12:30, which faded CAD by 165 pips (1.29%), virtually a complete reversal. Note that this is the kind of move you normally only see with CPI or interest rates, GDP usually has a much lesser effect. Otherwise it was a dull day for the dollar. EUR was slightly up, JPY and Gold were slightly down, and AUD and GBP were flat. As CAD is only 9.1% of DXY it had limited effect on DXY which closed flat, as did 10-year yields. Oil gave up Wednesday’s gains despite the EIA Stock beat at 15:30. 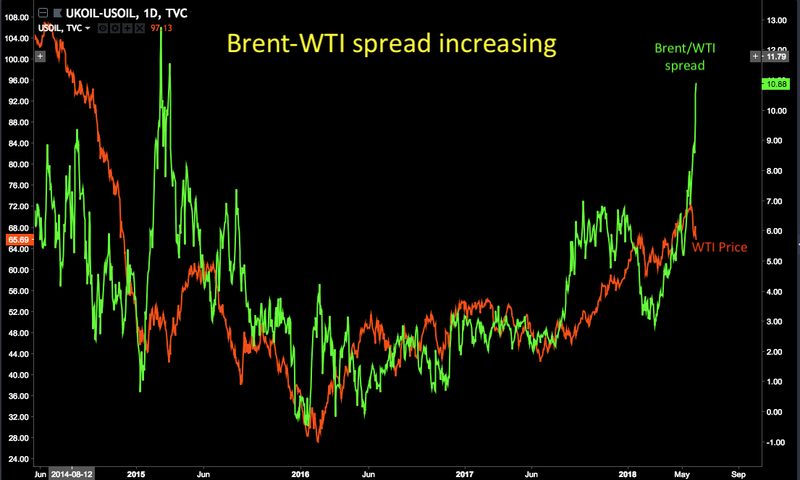 Notably the Brent-WTI spread hit a three year high of $11, reflecting confidence in US shale output. In general non-US oil is priced in Brent. Friday saw Italy form a new government, albeit the strange coalition of M5S and Lega, but at least there are no new elections. 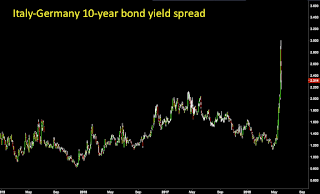 MIB added 1.5%, and both Spanish and Italian bond yields tumbled. In other good news, NFP figure came in at 12:30 as a healthy beat (223k vs 188k), with average hourly earnings up 2.7% (last month 2.6%) and a beat on unemployment. All indices were up, although of the majors, only SPX and NDX ended with green candles for the week. 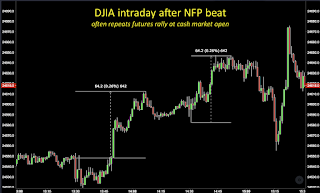 The DJIA exhibited a pattern seen many times before on NFP beat, rising in futures immediately after the release, then rising again by the same amount in the cash session. The index took a few minutes before the first rall, so it was particularly easy to trade. Look out for this pattern on future NFP beats. It was another mixed day for currencies. In general it was a good day for USD, with JPY and Gold down sharply, and Oil continued to fall in line. AUD and CAD were fairly flat, and the only surprise was GBP which rallied all day after the Markit Manufacturing PMI beat (which we signalled last week as significant) at 08:30. Yields were up in line with the dollar, up 6bp at 2.47%. A very flat week for USD on everything except NZD. The best trade would have been to buy NZDJPY for 1.19%, the lowest forex gain for months. Indices were also quieter, with the downward move in the DAX being the largest. Even cryptos were virtually flat. There are no Fed speakers this week as they are in the purdah period prior to the rate decision next week. Data is also light, although as the UK Manufacturing PMI boosted sterling last week, the Construction PMI may also have a larger than normal effect. BoE Etheridge speak at 15:45, and BoE MPC member Tenreyro (voter, centrist) is on at 17:00. Australian yields rose sharply last Friday in anticipation of a possible hike today, although consensus is still for a hold. Notably the bank has said that falling house prices (Australian house prices have fallen for eight months in a row) are not a consideration. We now have a partially priced in hike, so expect AUD volatility whatever happens. Also, in addition to a raft of PMIs is the US JOLTS Job Openings report at 14:00. ECB President Draghi speaks along with his predecessor Jean-Claude Trichet in Frankfurt at 13:00. BoE Cunliffe (dove, voter) speaks at 11:00. Following the rate decision, Australian GDP is estimated to be twice last month’s figure at 0.8%. A miss on this ambitious estimate could reverse any movement upward from the rate decision (or vice versa on a beat after a rate hold). We have three ECB speakers today Praet (dove, voter) at 07:00, Hakkarainen at 13:30, and Angeloni at 16:10. BoE Tenreyro speak again at 09:00, and BoE McCafferty (hawk, voter) is scheduled to do a vox pop Q&A on London LBC Radio. Eurozone GDP rarely makes much of a splash and usually comes in as estimated, as the individual nations have already reported. Of more interest are the CB speakers, BoE Ramsden (voter, position unknown and therefore interesting) at 14:00, and BoC Poloz discussing the contents of the Canadian Financial System Review. Another former CB leader is on today, Ben Bernanke discusses “Lesson Learned from 10 Years of QE” at 18:00. NDX component (1.302%) AVGO reports after the bell. Today sees Canada’s NFP and other employment figures, a week after the US NFP. The jobs estimate is not available at the time of writing, but an improvement of last month’s negative figure is likely. USDCAD sharp movement is still expected. Staying north of the 49th parallel, the two-day G7 Summit opens in Quebec. The only CB speaker today is ECB Mersch (hawkish, voter) at 07:15. Markets will also start to position themselves for the following week’s all important US (and EU) rate decisions, where a US hike is widely (91.3% per FedWatch) expected.